Are you interested in transforming your home with a warm, old-fashioned look, but still preserving a touch of class and elegance? Rustic glam décor ideas combine vintage, antique-inspired designs with modern decorations that give off a sense of wealth and glamor. 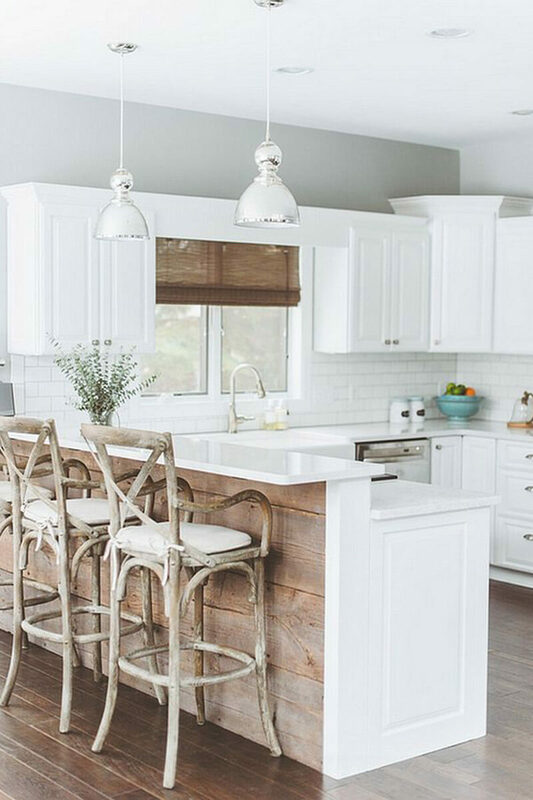 This might seem like a tall order, but with the right decorations and furniture and a careful balancing of decor, you can easily create a rustic glam look in your own home. Many of these pieces seem to fit together naturally, like antique silver candlesticks and new mirrors with rustic frames. “Rustic” and “glam” designs might seem like complete opposites, but with careful planning, they can work together perfectly. Many rustic glam decorations are affordable, with some available online or at craft stores, and others easy to make by hand. In fact, homemade décor often have a certain flair and personality that can’t be found with store-bought ones. Rustic glam designs might include mirrors, candlesticks, vases, throw rugs, chandeliers, pillows, wall plaques, and more. Choosing a theme or color scheme will help you keep the design consistent, as it’s easy to get lost in the myriad of products and how-to guides. 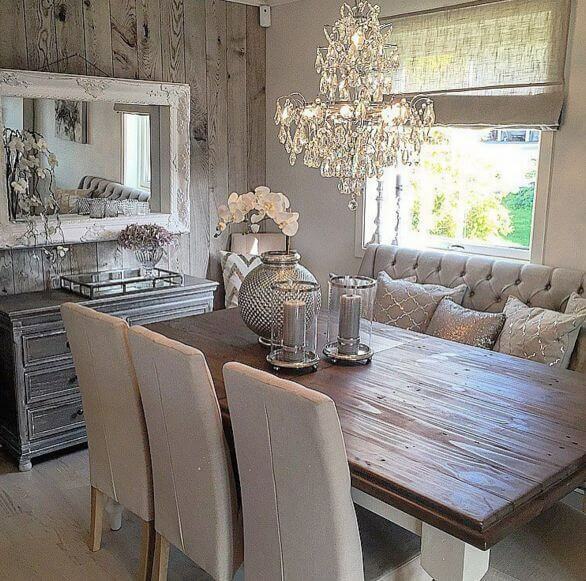 Interested in incorporating rustic glam decorations into your own home? These designs are some of the best you will find. Combine silver plate and pale pink flowers with this attractive table arrangement. A large footed bowl with etched lettering overflows with pink hydrangeas. A smaller jar with peonies holds a letter decoration. Use crocheted doilies on the table. The arrangement complements the ornate chandelier overhead. Silver ties this area together. An oversized, shiny lamp and vase bracket the ends of this side table. Pink blossoms provide height. Family photos are framed in white and pewter. The mirror gives depth and dimension to the arrangement. An inviting throw and pillow rest in a basket under the table. Use vintage white pitchers as silverware holders on your table. This will make them easy to access and give the table a quirky, homey sense of style. Lovely peonies fill the center of the table and make a charming focal point. Use eggcups to hold accents. A uniform beige, gray, and silver palette ties this design together. Oversized sofas with large and comfortable pillows invite you to rest. 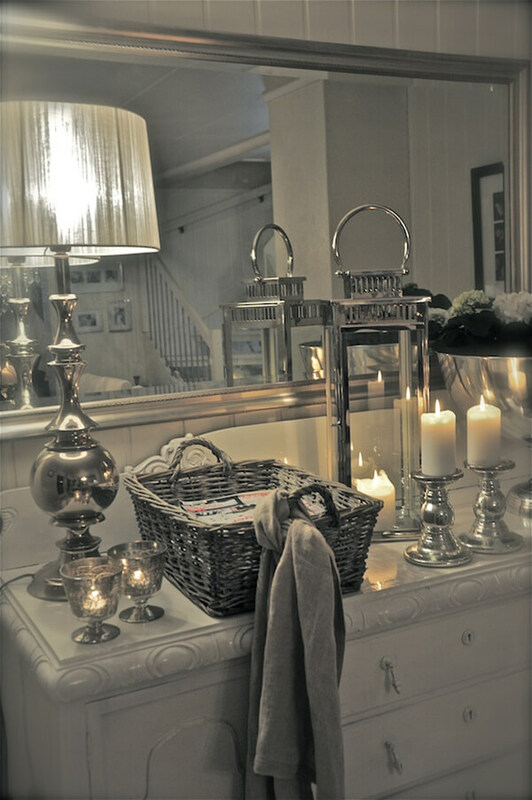 A tray on the coffee table holds silver candlesticks. 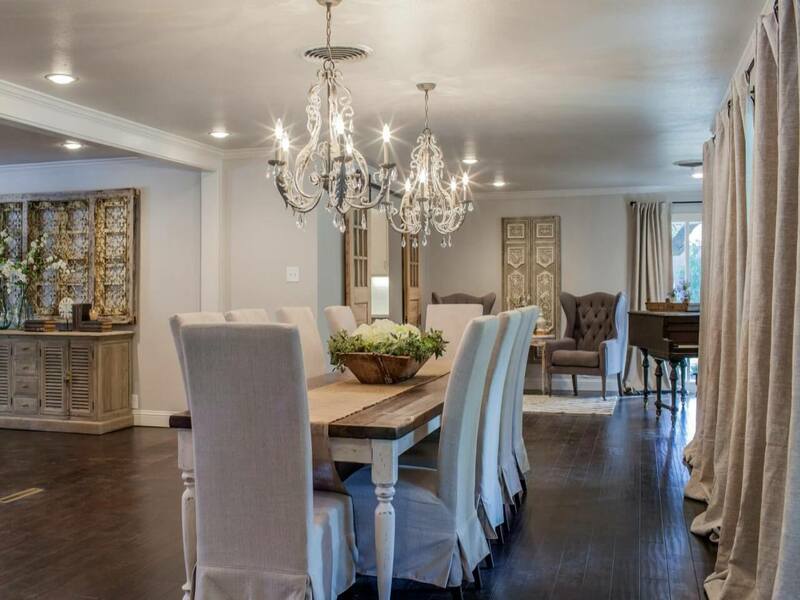 Sparkling chandeliers bring unity to the living room and dining room. 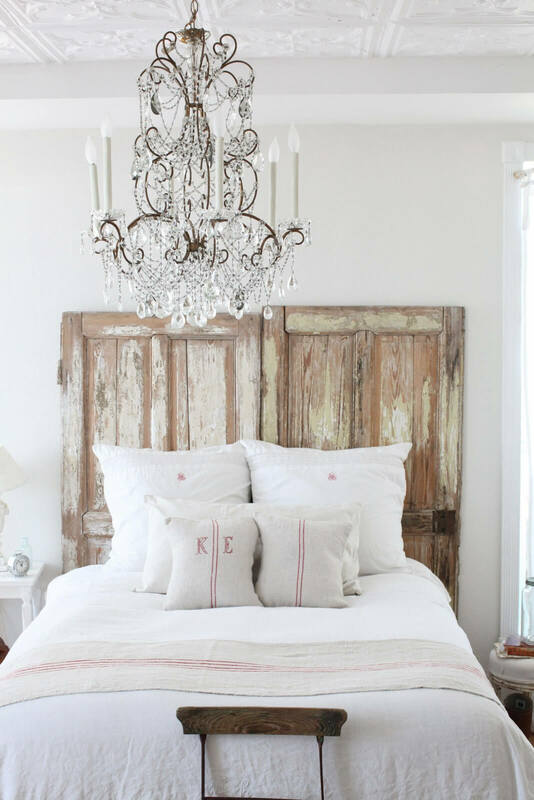 This attractive bedroom features two distressed vintage farmhouse doors as a headboard. The rough texture of the boards contrasts with the smooth, simple white bedding. The room features a charming tin ceiling. A tall, intricate chandelier completes the room. This room takes advantage of the reflective surfaces, both in the mirror and in the accents. 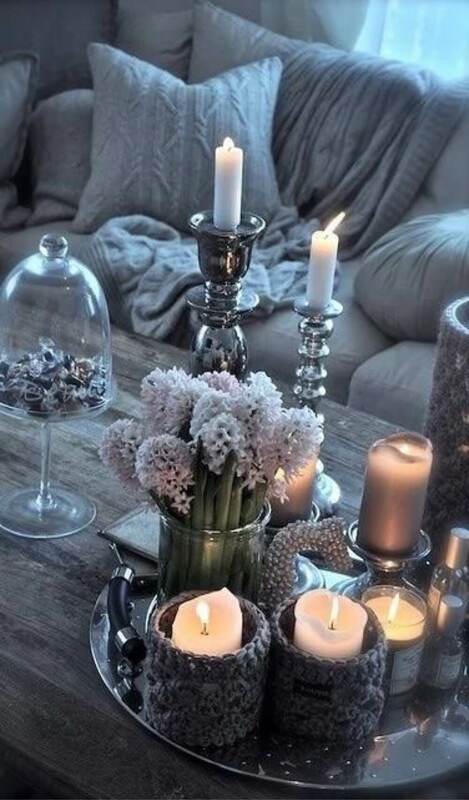 Shiny accents multiply the candlelight. Multiple levels of candles are used, from small tea lights to large pillars. A tall silvery lamp makes an elegant focal point. Plush textures surround you in comfort. 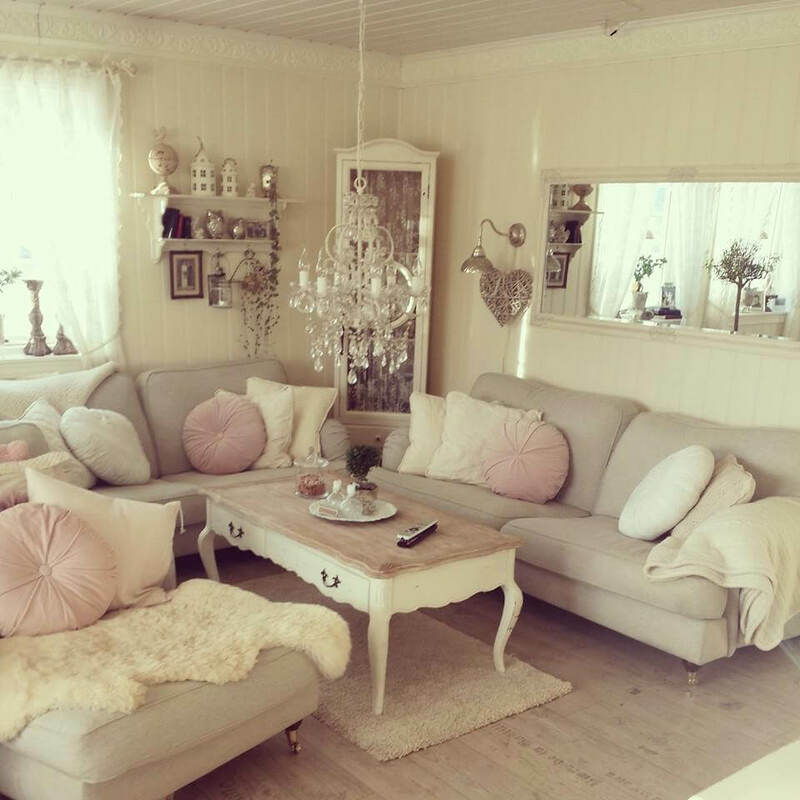 A mixture of white, pale pink, and silver gives this room a unified look. Again, mirrors and silvery decorations are used together to multiply the effect. Candles glow softly in their tall holder. A fluffy rug and pillow provide whimsical accents. 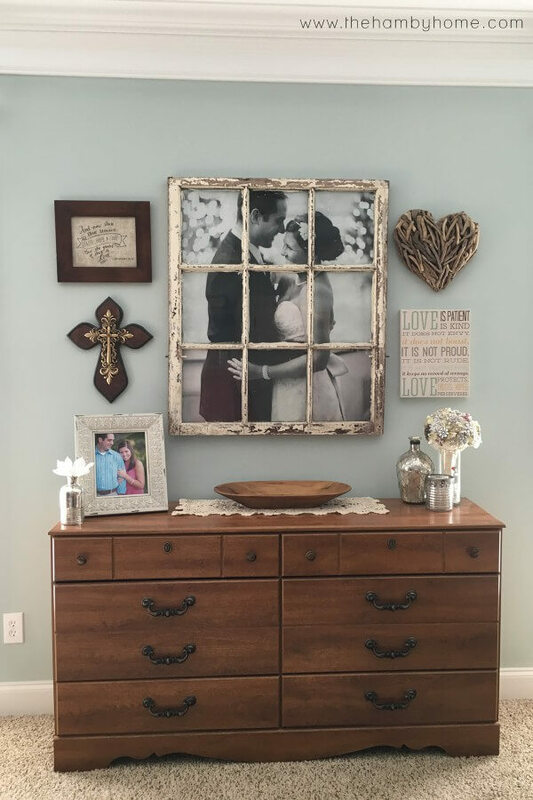 The focal point of this arrangement is a wedding photo displayed behind a vintage window frame. Homey wooden accents surround the photo frame, including a cross that emphasizes the homeowner’s strong faith. A touch of silver brightens the corner of the dresser. In a variety of heights, these antique candlesticks bring a touch of glamour to the room. The candles are lace textured for an elegant look. The antique gold tone finish on the mirror frame brings out the silver of the candlesticks. Greenery is laid on the ledge. In this elegant kitchen design, unique lamps take pride of place. With a modern hooped design encircling a chandelier, these lamps draw the eye up to the exposed wooden beams. The kitchen cabinets are pale blue and echoed in a pitcher of flowers. The granite countertop completes the look. This design features a sophisticated beige and silver color palette. The light wood paneling complements the farmhouse table and sideboard. The look is modernized with an upholstered sofa and large, shimmering cushions. 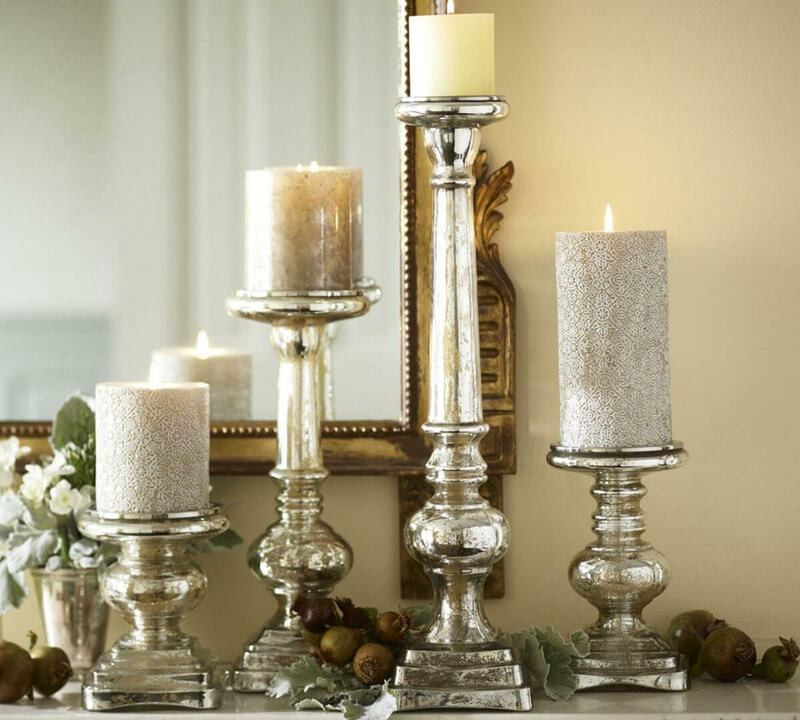 On the table, tall metallic pillar candles are ready to bring a warm glow to the room. 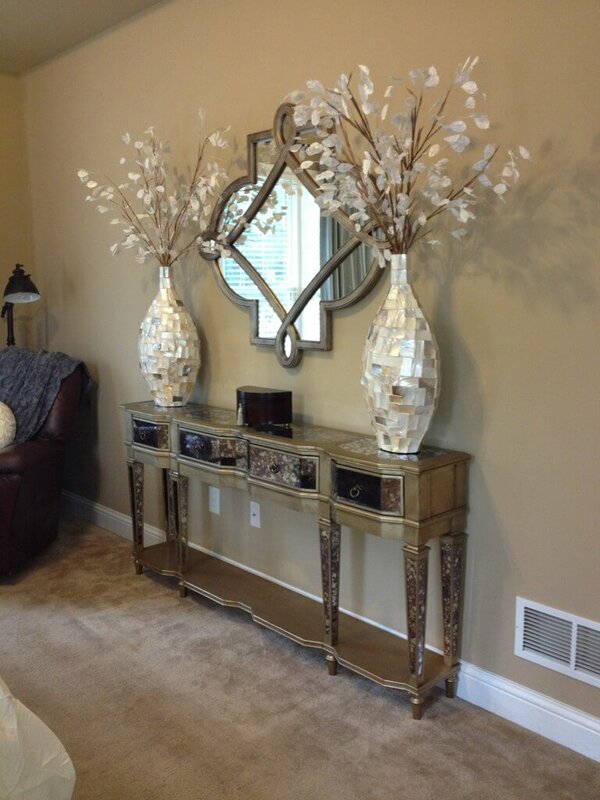 The round, bejeweled mirror is the focal point of this arrangement. 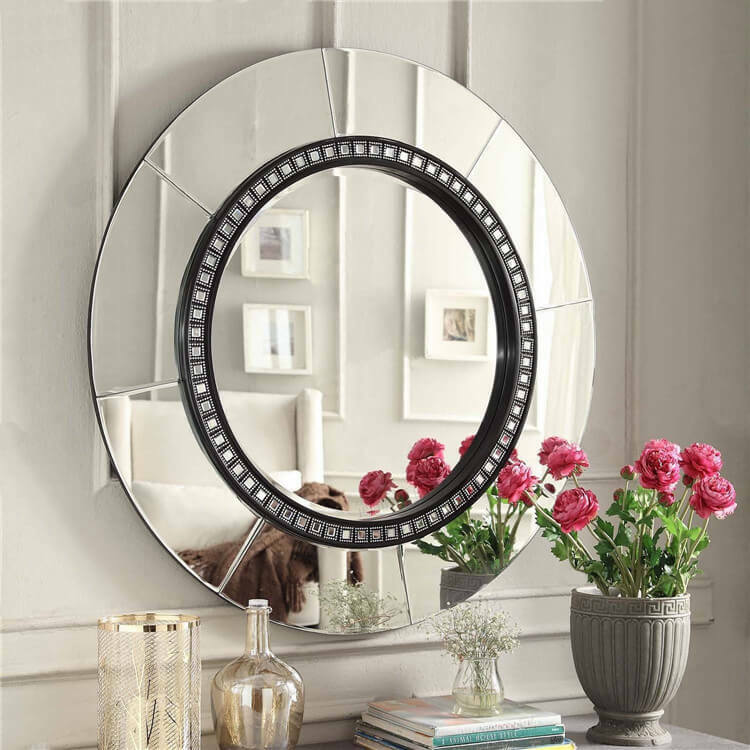 Simple and chic, the mirror reflects the light gray and silver accents. The mirror is frameless and reflects the uniform white color palette of the room. A bright pink bouquet provides a pop of contrasting color, enlivening the room. Dramatic mother-of-pearl vases and branches with silver leaves give the room a novel look. The mirror is much less elaborate than the vases, taking a back seat in the décor. 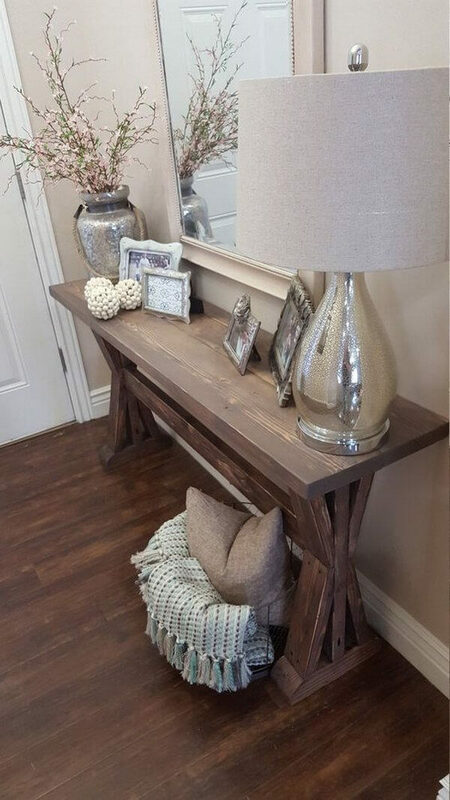 The console table also has a pearly finish, bringing a touch of luxury to the room. 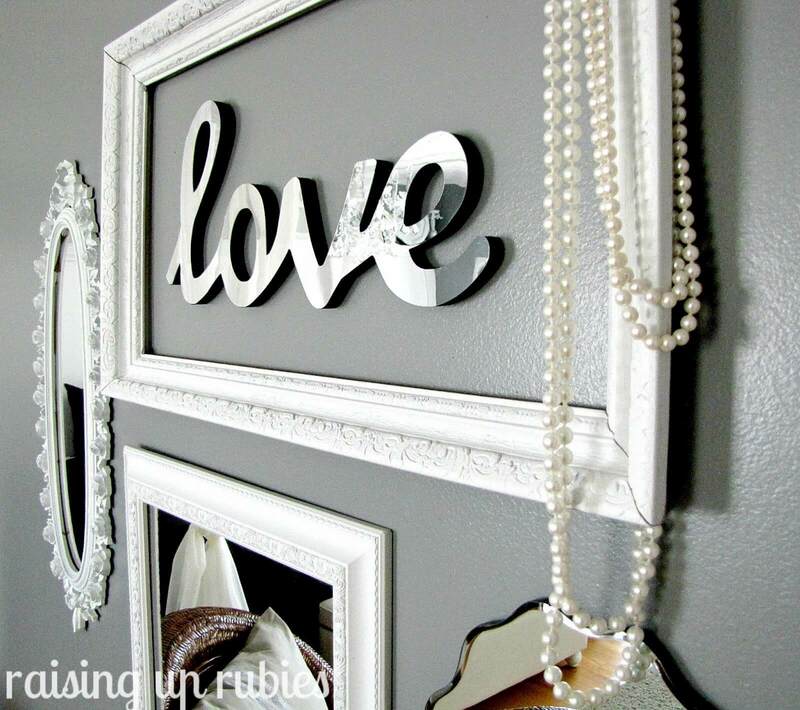 This design takes a silver lettered sign on a gray wall and surrounds it with a frame. The color palette is simple and clear. Multiple mirrors provide reflecting light. Over the corner of the frame hang a set of pearl beads, giving visual interest to the arrangement. This kitchen has a simple, unified look. Stark white cabinets and countertops provide a neutral backdrop. Rustic wood accents the kitchen, in both the bar stools and the back of the bar itself. The only pop of color in this kitchen is the brightly colored fruit bowl on the countertop. 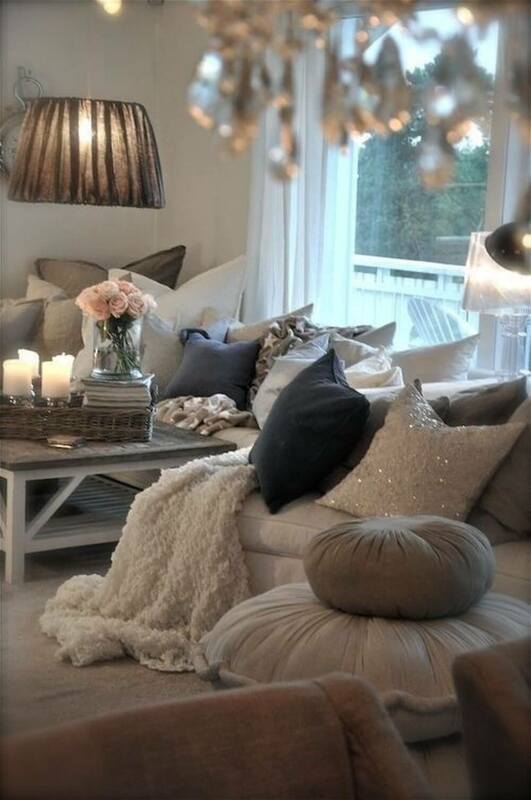 A jumble of pillows and throws in various luxurious fabrics tempts the viewer to sit and relax. The shimmering and velvet fabrics enliven the arrangement. The oversized taupe lampshade contrasts with the shine of the chandelier. A pale bouquet of peonies completes the look. This arrangement combines rustic glam with European flair. 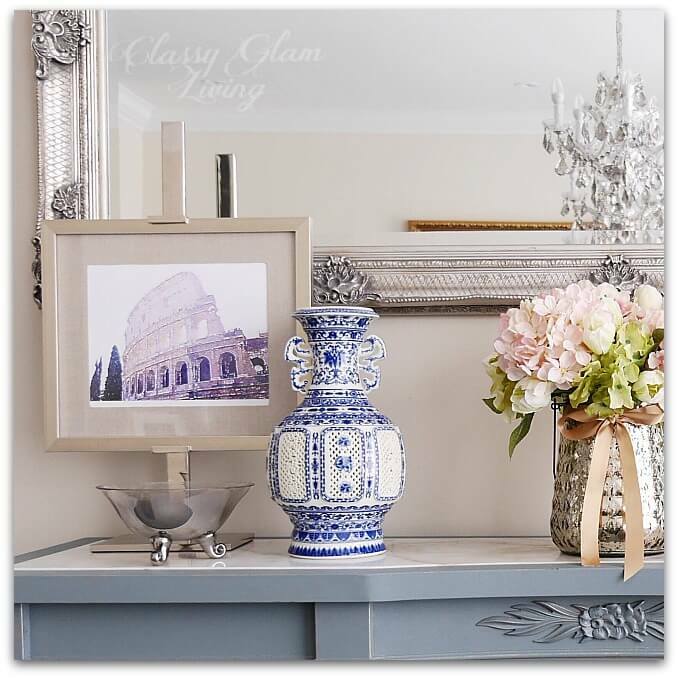 A silver pedestal frame holds a photo of historical ruins. The silver framed mirror behind it has an old-fashioned sensibility. The fine porcelain vase and pale pink hydrangeas provide color. A chandelier is reflected in the mirror. 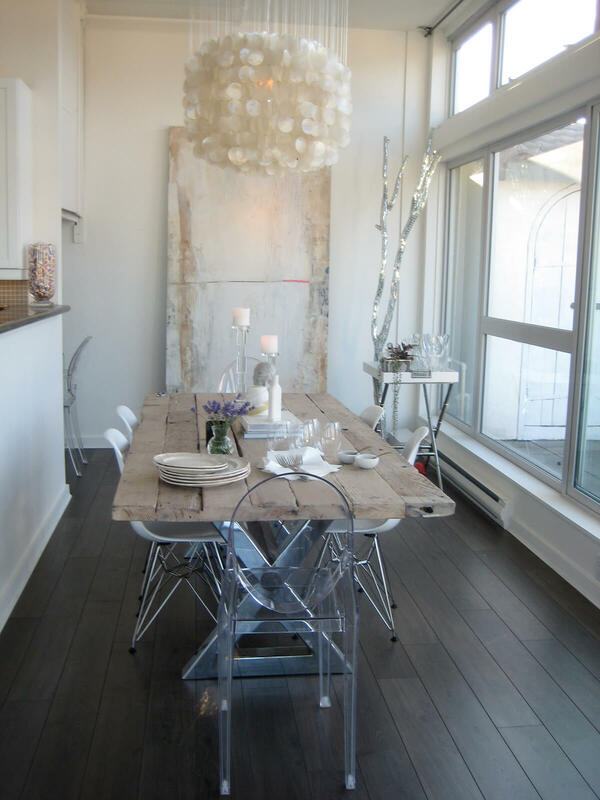 This dining area combines a stripped-down and modern look with the metallic accents of rustic glam. The table itself is a study in contrast, with a worn wooden top and industrial base. A casual, beachy seashell light fixture hangs over the table. Silver-wrapped branches in the corner add visual interest. The dining area is inviting and simple. 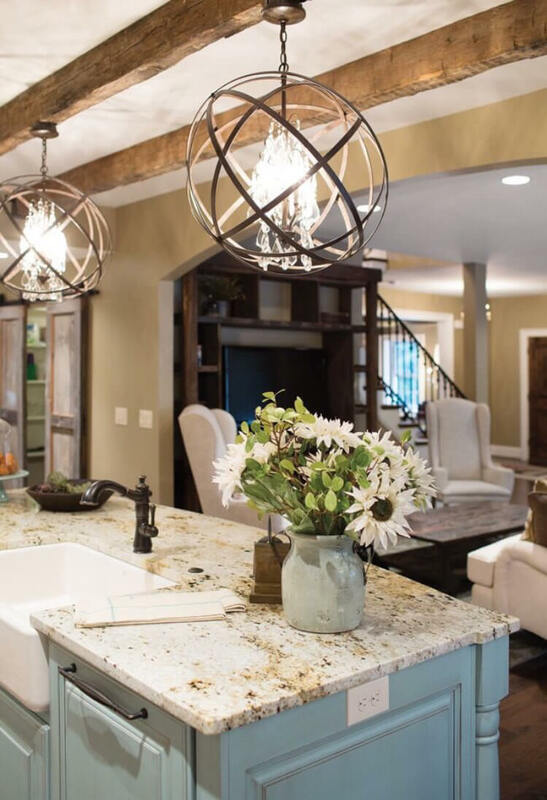 This design marries the farmhouse style with luxurious accents. Plush furniture, cushions, and throws invite relaxation. Candlesticks of various heights provide light and romance. Natural touches come from a topiary tree on the side table and a tall vase of flowers. The coffee table is designed like a traditional hope chest. 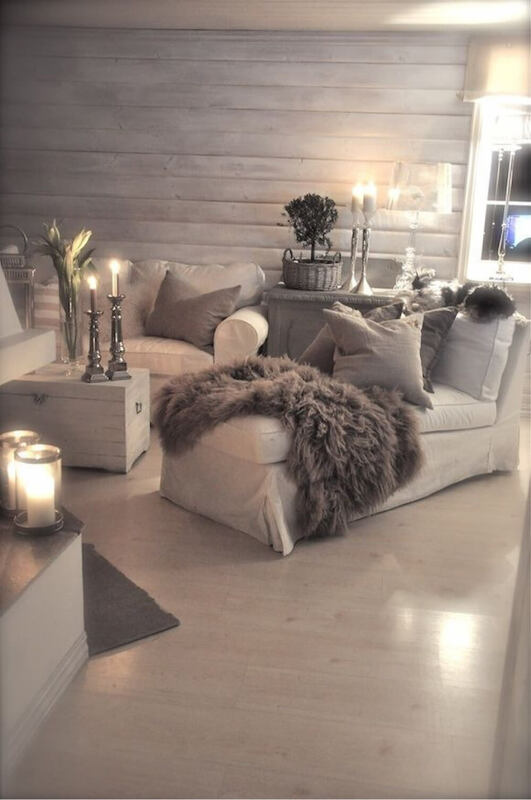 This comfortable seating area in neutral gray tones provides a soothing backdrop for the glimmer of silver accents. Combining various textures from cable knit to smooth mirror glass, this room has a calming quality. The glass and silver magnify the candlelight and give the room a warm glow. This entryway gives a sophisticated impression to visitors. It is open and clean. 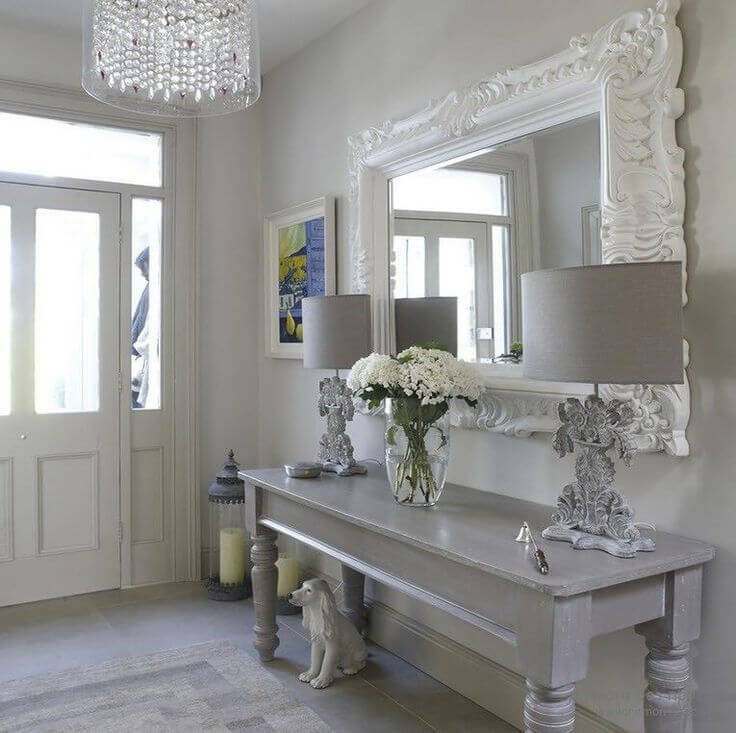 An ornate and oversized mirror hangs over the hall table. Two antique style lamps stand on the table to either side. An overflowing vase of white flowers is showcased in the middle. A charming dog sculpture stands under the table, giving a touch of charm. A painting behind the door draws the eye. This dining area combines a farmhouse table with comfortable yet elegant chairs. 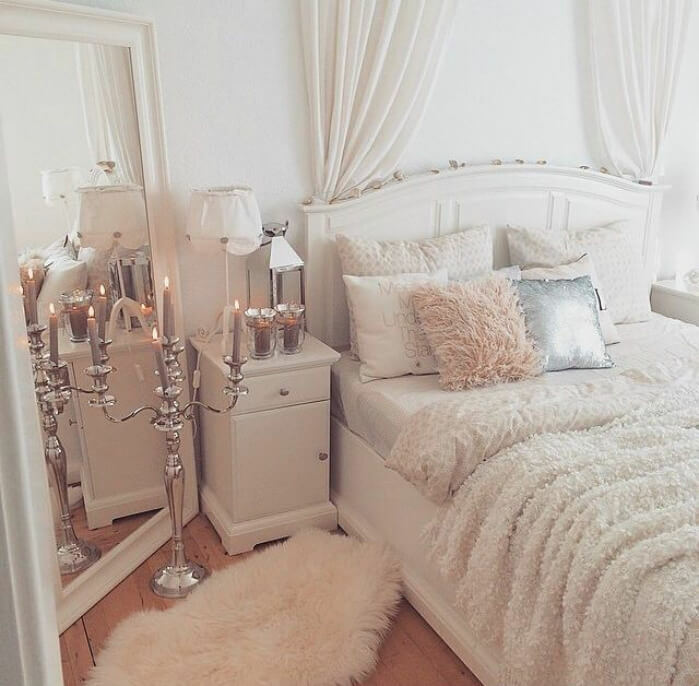 Shades of white, beige, and taupe unify the room. A low, wide flower arrangement draws the eye to the table. Another farmhouse touch comes in the sliding doors to the kitchen. 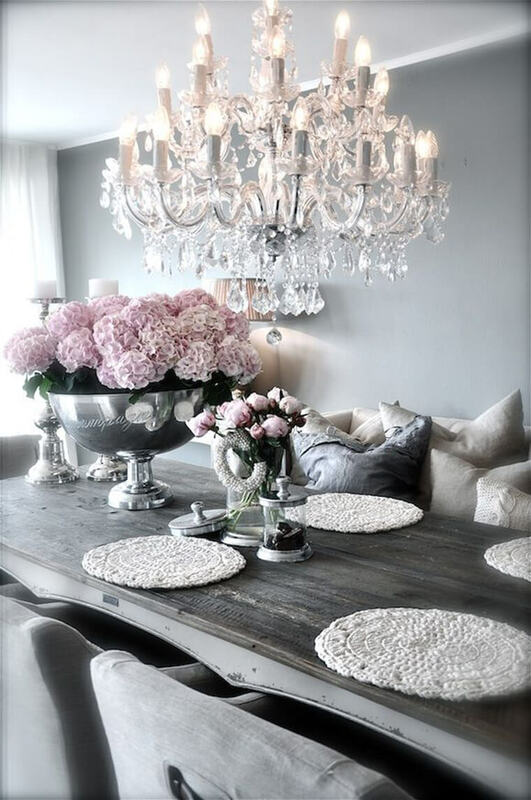 Two simple chandeliers with an understated sparkle hang over the table. At the far end of the room is a seating area with antique-style armchairs. A crystal-embellished mirror hangs over a marble bathroom sink. 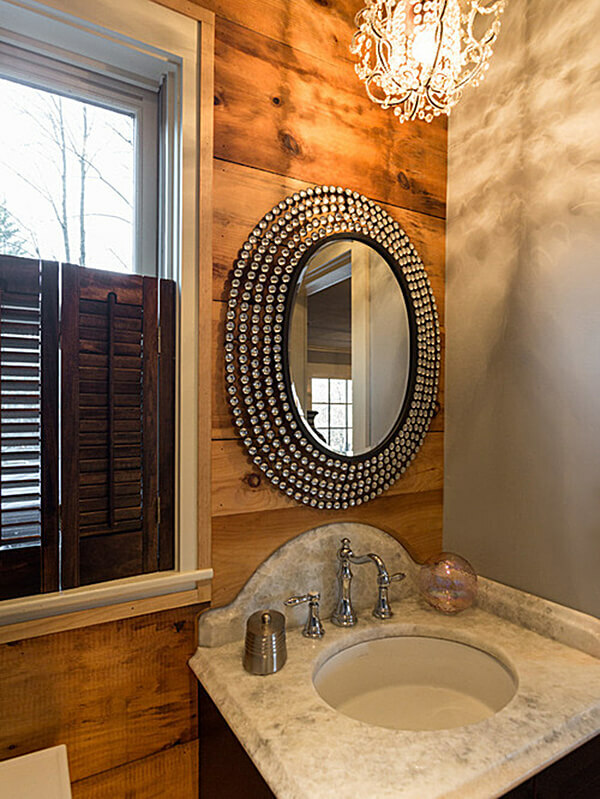 The simple wooden paneling wall contrasts with the glittering elegance of the mirror and chandelier. The window shutters provide privacy while keeping the design simple. The wooden wall gives the bathroom a sense of warmth. An iridescent glass globe accents the sink. A dramatic chandelier hangs over a simple, rustic table design. Intricately patterned blue fabric accents the window shades and the cushions on the sofa. 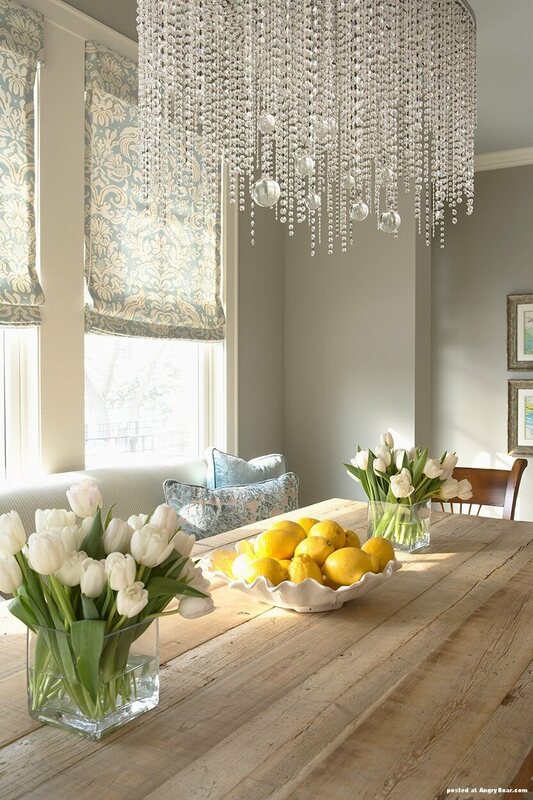 White tulips and a bowl of lemons provide a focal point for the room. The combination of the sky blue fabric and the brightly colored lemons enlivens the arrangement. 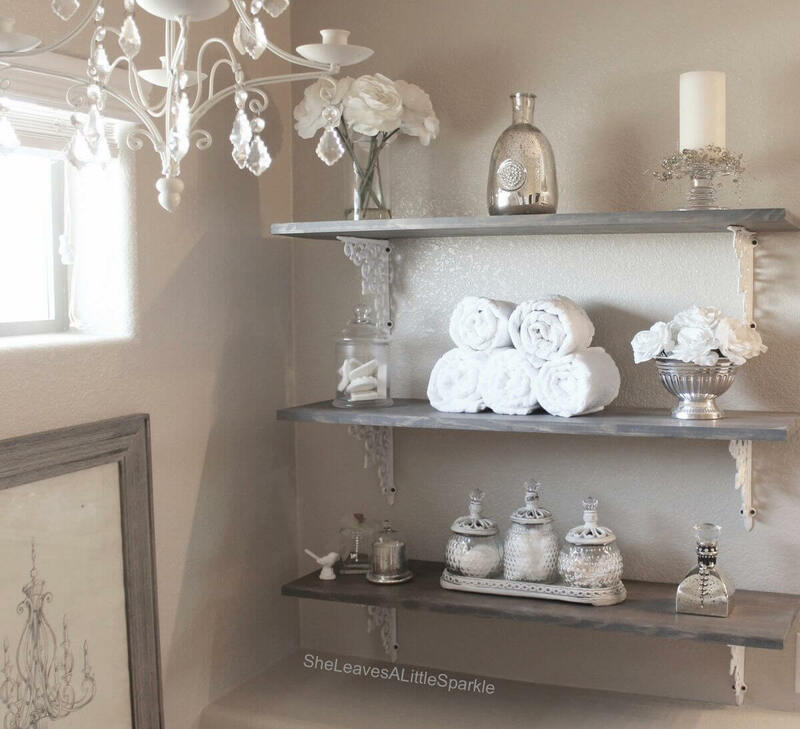 This bathroom corner combines practical storage with pretty metallic and rustic white. Different glass jars contain soap, cotton balls, and cotton swabs. A perfectly rolled set of bath towels stands in the middle of the shelf. A simple chandelier with glass crystals hangs overhead. This oversized frosted glass and mirrored vase provides an elegant and dramatic base to this all-white floral arrangement. The various types and textures of the flowers sit against the green background of their foliage. The coffee table books invite the visitor to page through them and be inspired. A tray with wine and glasses makes an inviting addition. 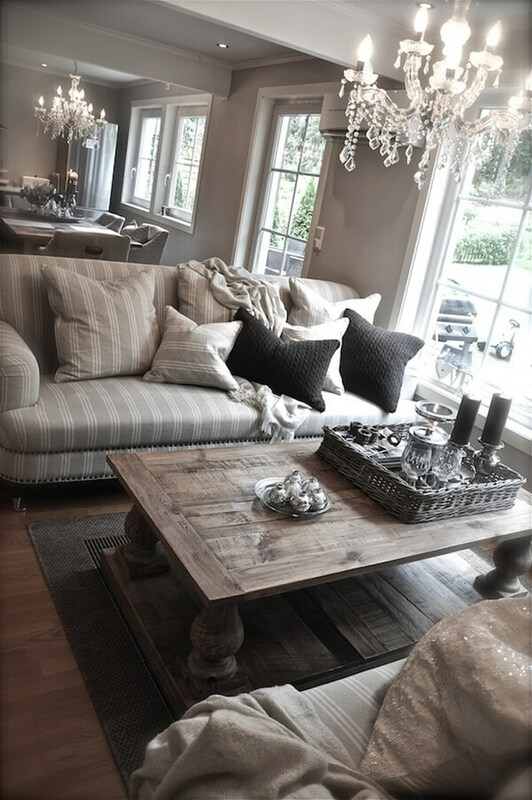 This calming beige living room centers around a farmhouse coffee table. Plush pink cushions and a sheepskin invite the visitor to sit and make himself comfortable. The room is full of country-inspired accents on floating wall shelves. A wire heart draws the eye to the corner of the room. A chandelier hangs low in the middle, bringing the light down to eye level. A modern mirror that evokes the sun hangs over a subdued wood dresser. While most of these designs feature silver metallic accents, this one features gold tones. A chunky initial letter gives a distinctive touch. 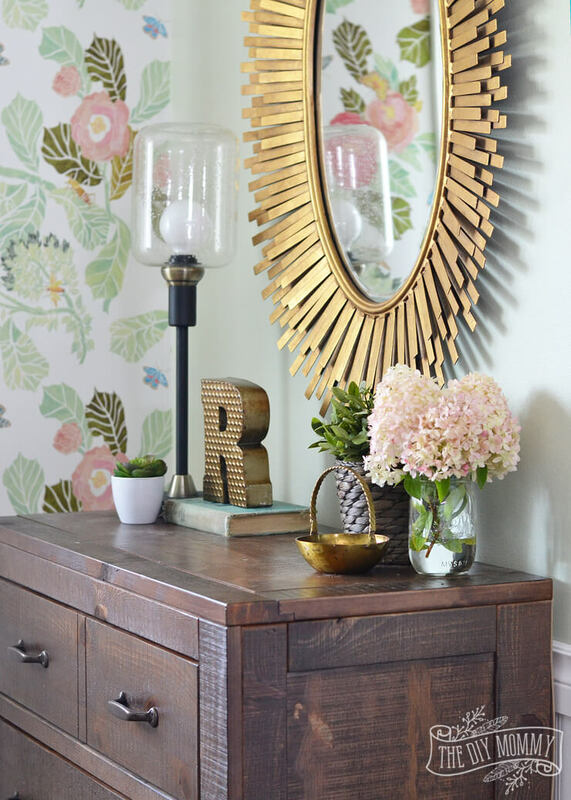 A simple Mason jar is used as a floral vase, contrasting with the bold design of the mirror. This centerpiece is lovely for any special occasion. 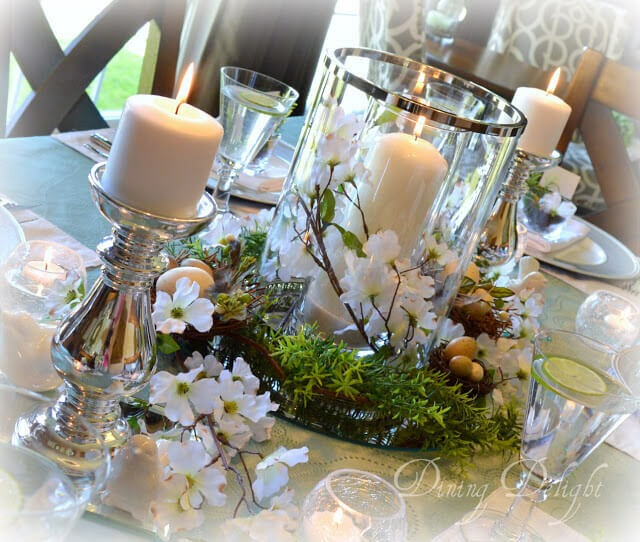 Pillar candles stand in glass holders with white blossoms twining around them. For Easter, tiny birds’ nests with eggs nestle in the greenery. Silver and glass provide movement of light throughout the arrangement. 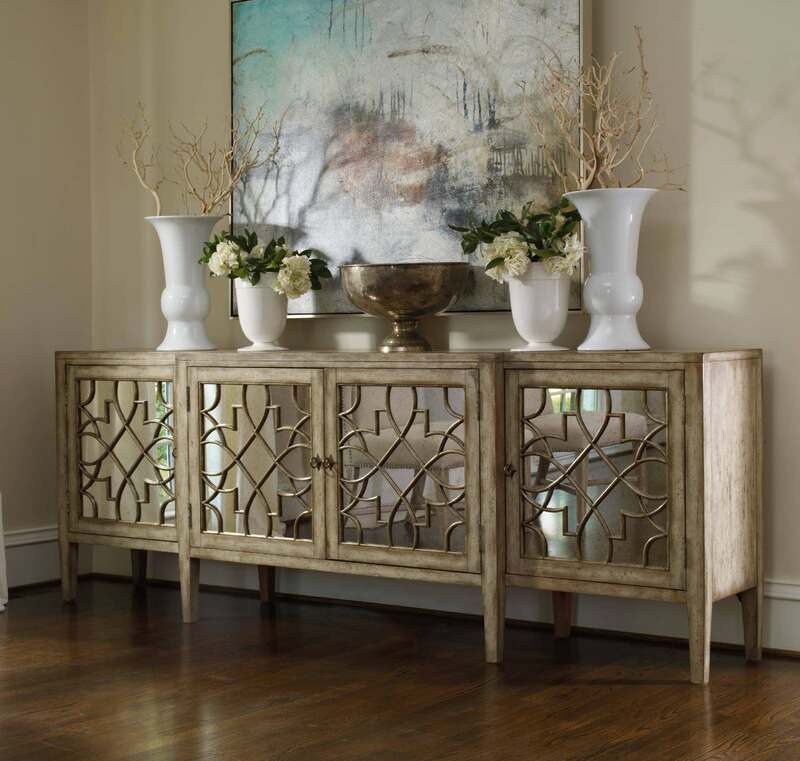 This arrangement highlights the intricately patterned mirror doors of the buffet table. Unlike many of the other arrangements in this article, the vases and bowl are in a symmetrical arrangement. Bare branches bring height to the taller vases. White flowers rest in the shorter vases. A weathered pewter-look bowl stands in the center. The arrangement is backed by a pale blue and brown abstract painting.